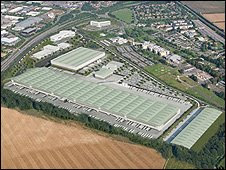 The word megashed has been cropping up a lot recently, mainly as a result of the campaign in the Test valley to stop Tesco building a mega-distribution centre near Andover and not far (but not that close either) to megalithic Stonehenge. Megasheds have been around for a while - especially peeking above the banks of motorways on the periphery of cities. So the protest movement may have been slow off the mark. Magasheds have been the developer's choice for retail space and storage for over a decade. Shedman once met a man called Shed Wilkinson who was a planner for Ken Livingstone and the Greater London Authority. He reckoned he was responsible for building more sheds than anyone else in Europe, most of them distribution centres around the M25.